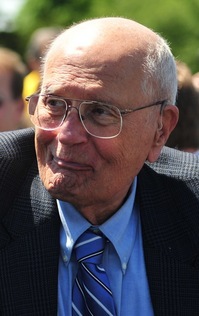 Posted on Mon, Jan 23, 2012 : 7:03 p.m.
U.S. Rep. John Dingell, D-Dearborn, offered his thoughts on Monday's announcement that President Barack Obama will visit Ann Arbor on Friday. In a prepared statement, he called Michigan "a microcosm of what we need in this country to revise unworkable old mentalities and explore new ways to get America back on track." "The President is always welcome in my District. I am delighted, but not surprised that the President will visit Ann Arbor, Michigan, to discuss the important points of his State of the Union address. Like the President, I believe we must strongly focus the 112th Congress on the need to build our country and economy to be competitive with our neighbors. "Michigan is a microcosm of what we need in this country to revise unworkable old mentalities and explore new ways to get America back on track. In fact, the four pillars of his central mission for our country have been the keys to Michigan’s continuing recovery. The president wants to build American manufacturing, with more jobs, small businesses and more products labeled ‘Made in the USA’; expand American energy like we are already exploring in Michigan with alternative fuels, advanced technology vehicles and renewable energy sources. He also wants to improve the skills of American workers with education and training that will allow them to compete vigorously in a globalized economy. The University of Michigan is one of the top universities in the country that has trained students for a variety of in-demand careers — health care, alternative energy, engineering, and science among others. Finally, last but not least, he wants us to return to American values, and I again agree with him. Tue, Feb 21, 2012 : 7:02 p.m.
Dingell is a pillar of the country. The hate spewed from the Republicons is a testament to his greatness. Good Night and Good Luck. Tue, Jan 24, 2012 : 6:34 p.m.
Thu, Jan 26, 2012 : 1:21 a.m.
That gentleman makes Rep Dingell look like a right winger. Since all of us are going to crossover in primary, we need to band behind a R that is a RINO. Thank you for all the good you have done Mr. Dingell. If it weren't for people like you, the middle class wouldn't exist anymore. Tue, Jan 24, 2012 : 1:17 p.m.
University of Michigan is the most GREEDY University there is. The wages of employees are very high and heard one man they couldn't belevie thier raise, now that shows they are over paying.Greedy bookeeping is going to catch up one day. Maybe Obama will become a govoner or Michigan if he looses the race to stay in office. Tue, Jan 24, 2012 : 12:44 p.m.
Has anyone tried to explain to Grandpa Simpson that it's not LBJ showing up on Friday; that LBJ is no longer President and has actually been dead for 40-years? Tue, Jan 24, 2012 : 3:13 a.m.
Tue, Jan 24, 2012 : 1:54 a.m. Politicians have become so afraid of doing the wrong thing that they don't do anything. We don't really have leaders anymore - just followers of poll numbers. The President will talk about all the things on the poll list that most Americans are supposedly concerned about, and propose programs that really won't change much but will give the impression that he is doing something. His party will all jump in and threaten what will happen if the President's policies aren't adopted. The opposition will all start complaining that the President is trying to destroy the country, and we better do something else instead. In the end, what comes out will be a few new watered down programs that now have no hope of accomplishing anything. And we all wait to see if the economy improves before November. It's the same script every election cycle unless the economy is booming. Tue, Jan 24, 2012 : 1:31 p.m.
Dingell at 85 is twice as good as most members of Congress ever where. This is the man who fought for 55 years for us to get health care. Thank you John! Tue, Jan 24, 2012 : 5:46 a.m.
so what you're saying is this is a man that has lived off the government teet for 55 years and hasn't had to work at a real job...if he is so great, why hasn't he done more than give us lip service? Free healthcare? It's my understanding there is a government supported healthcare plan available in Washtenaw County for a long time...cost is based on income...oh wait that's right...a lot of people want it for free...which is really paid for by taxpayers....what happens when there aren't enough taxpayers coughing up the money to cover the freebies? That's the problem with socialists...eventually they run out of other peoples money...Did you read his statement? The need for the 112th Congress to focus...? What was he doing in the 110th? 11th? Tue, Jan 24, 2012 : 1:31 a.m. These politicians make me sick. (Yes, both democrat and republican) Anything for the spotlight or to try and take credit for something! If you don't believe me, tell me what Dingell actually said in his &quot;statement&quot; he felt he needed to release that isn't vague and completely obvious. Tue, Jan 24, 2012 : 12:48 a.m.
Tue, Jan 24, 2012 : 12:45 a.m. He is still 10 times better than anything the teapartiers/GOBPers can come up with. And no I did NOT vote for Obama and nor I plan to do so this time. Tue, Jan 24, 2012 : 12:49 a.m.
Tue, Jan 24, 2012 : 12:43 a.m.
Tue, Jan 24, 2012 : 12:29 a.m.
Senility commenting on incompetence. The quote from Dingell just about made me puke. The president does not want any of those things. jondhall you are so right! Obama plans to hold his present office for as long as Dingell has held his. Tue, Jan 24, 2012 : 12:15 p.m.
Yep, he's going to make himself dictator for life and then enslave the white race in FEMA camps, right? What else would a Kenyan Communist Hawaiian Indonesian Muslim do? Tue, Jan 24, 2012 : 12:21 a.m. I say let's retire them both next year, the time has come! Dingell has earned his lifetime retirement, let's let him collect it.